This Fresh Tomato Basil Sauce with shrimp is what happens when I have lots of cherry tomatoes and basil taking over the garden. Quick and easy, absolutely the best homemade summer sauce ever! 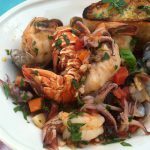 “ Umido di Gamberi al Pomodoro Piccante “ the magic of this dish comes from lots of garlic, red pepper flakes and freshly squeezed lemon juice combined together with those fresh tomato juices. Like shrimp scampi but Better! For Reals you guys! Go crazy with the fresh basil, but only add it to your dish at the very end, just before serving, or it will lose that fresh flavor if cooked. Feel free to add a couple of handfuls of baby arugula or spinach as well to bump up the nutritional value. Capellini noodles, also known as angel hair pasta, are a must for this light zesty garlicky sauce. If you are looking for a thick spaghetti like sauce then you should make this arrabbiata with canned San Marzano tomatoes instead. 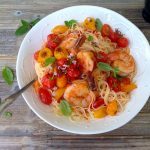 Quick and easy, the best homemade fresh tomato basil sauce ever with garlic shrimp and red pepper flakes! Start by bringing a pot of water to a boil and cook the pasta according to the directions on the box. Meanwhile preheat your broiler. Set the clusters of cherry tomatoes on a broiler safe dish. Drizzle with a lug of olive oil and a pinch of sea salt. Broil them until they burst and start releasing their juices. About 5 minutes or so, and keep warm. Heat up the 4 tbsp of olive oil in a sautee pan over medium low heat. Add the garlic and cook for about 35 seconds until it releases its flavors (don’t let it get any color. Add the red pepper flakes, diced tomatoes and the halved cherry tomatoes. Let them to simmer on low flame until they start to release their juices (3-5 min). Season to your taste with the sea salt. Add the cleaned shrimp, cover with a lid and cook an additional 2 to 3 minutes or so, until no longer translucent, slightly pink and curls up. Add the squeezed lemon juice and lemon zest. Adjust seasoning with the salt and pepper then add the the capellini to coat nicely in the sauce. Transfer to serving plates, dividing the seafood between them. Finish with a nice drizzle of extra virgin olive oil, some of the broiled cherry tomatoes and sprinkle with the basil leaves. Serve with extra lemon wedges on the side. Basil blossoms were a nice finishing touch here because I just happened to have them. You can garnish with garlic or onion chives and flowers as well. 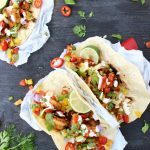 Shrimp is optional here so you can make this vegan or vegetarian by simply leaving the seafood out of the recipe. My favorite is Chicken spaghetti with white sauce and broccoli. I really love penne with vodka sauce and pancetta! Or spaghetti with fresh tomatoes, capers, and mozzarella. The one I make at home. I have a sausage and peppers recipe that I love. I think I like this recipe as a favorite! I can’t wait to try it! Normally, I just get a good jarred sauce with plenty of garlic and tomatoes and add meatballs over angel hair pasta…though, now that seems so plain after seeing these pictures. My favorite pasta dish is shrimp scampi with angel hair pasta. My absolute favorite pasta recipe is the super simple pasta and peas dish my Italian grandmother used to make when I was a kid. Oh yummy! Is that the one with ricotta cheese ? That’s how I remember mine..
Browned butter, sage , and tomato sauce over noodles. I love the Italian Sausage Pork Ragu with Baby Spinach. I love the Garfield special Lasagna! I love a rich creamy Alfredo. Any shape pasta makes a fine vehicle for me lol. I love the Cucumber Dill Salad Recipe. I have already made this and love it!!! So hard to chose just one. For me it’s a toss up between Aglio Olio or Carbonara. Chicken Tettrazinni is a favorite in our family. I like pasta plain with garlic and olives. I love a thick tomato sauce with chunks of fresh veggies and meat! Chicken spaghetti is hard to beat. Gnocchi with Sage Butter Sauce is my fave!!!! I love a good fettuccini alfredo! My pasta is Spaghetti with Meatballs. My favorite pasta recipe is Baked Ziti with fresh tomatoes! My favourite pasta recipe is my husband’s homemade lasagna..love it..5 cheeses and homemade sauce, so good! I love baked cheesy bow ties & corkscrews noodles in sauce. I like creamy cheese sauce on my pasta! I love homemade pasta with olive oil and some roasted veggies and tomatoes or maybe stuffed shells. And some fresh spices and it is perfect. My kids would probably pick spaghetti and meatballs or homemade mac and cheese. I love a white garlic sauce and seafood on a linguini. My favorite pasta recipe is spaghetti. My dad makes amazing sauce. Lasagna is definitely my favorite pasta. I have so many favorites. I love a meat spaghetti sauce with vegetables and meatballs. I also love pasta with pesto. Made a recipe the other day and wow. I also love pasta with maggi sauce and parmason cheese. It used to be pasta with creamy garlic, parmesan sauce with grilled tomatoes but after reading your recipe, I think I might have a new favoriet, Tomato Basil Pasta. My favorite pasta is probably my brother’s chicken alfredo or my homemade macaroni and cheese. We are a pasta loving family, so there is always pasta on the table at family holidays! Baked Ziti is my favorite. My favorite pasta recipe is lasagna. I will be making this tomorrow for sure! Thank you for the giveaway. My recent favorite is manicotti. Pasta and broccoli with Sundried tomatoes and garlic. Spaghetti with meat sauce is our favorite. My favorite pasta recipe is homemade lasagna. Traditional marineria sauce on spaghetti with a lot of sliced mushrooms. I love ziti with meat sauce and mini meatballs! I really love Fettuccine Alfredo with shrimp! Alfredo Fettuccine is my favorite. meat lasagna is my favorite pasta dish since I was a child, and it still is. My favorite is spaghetti with meatballs. What is your favorite pasta recipe ? 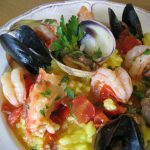 Seafood pasta is one of my favorite meals! Made from scratch spaghetti sauce and meatballs on pasta. My favorite is manicotti made by my Italian boyfriend — it’s his secret recipe and it’s delicious. I dont know the name but it’s made with an Angel Hair Pasta. It has a lemon butter and basil sauce. The protein is chicken and shrimp but also has artichoke hearts. chicken alfredo is my fav! My favorite is fettucini alfredo for sure. Pioneer Woman has a fantastic tomato blue cheese pasta that is amazing! My favorite pasta recipe is baked ziti. This sounds delicious, I also love pesto for pasta. I’ve got a one pot, 30 minute Fettuccine Alfredo recipe that is my favorite. I love Marcella Hazan’s ultra simple and delicious pasta sauce that’s nothing but tomatoes, onion and butter. Yum. I’ve always liked a simple spaghetti with meat sauce! My family loves pasta with pesto sauce, so they might love this recipe! I love spaghetti & meat sauce. I love a pasta Bolognese, chunky tomato mushroom sauce,meatballs, pretty much any baked pasta dish to. My favorite pasta recipe is a meat and mushroom lasagna with extra mozzarella cheese. Yum! I had a BF in high school and his mother made THE BEST pasta with meat sauce. He hated it, but I could eat bowl fulls! I love any simple spaghetti – butter, garlic, crushed red pepper. So easy to make and delicious! I love pasta! It’s tough to pick a favorite. I do love a good roasted veggie lasagna. I love making and eating lasagna.. I like steak gorgonzola alfredo. spaghetti with a tomato base sauce. I love lasagna & fettucini alfredo. My favorite is Baked Ziti! I love vegetable pesto pasta salads. My favorite is angel hair noodles with an olive oil and herb sauce. Shrimp fettuccine is an all time favorite of mine but, can never go wrong with pasta. My husband’s homemade, all-day sauce is amazing and perfect over spaghetti. I love Fettachini Alfredo but will definitely be trying this recipe. Thanks for the recipe & giveaway. My favorite is a cold dish we make in the summer: chicken bacon ranch gorgonzola pasta. Pasta Salad with shrimp and lots of fresh vegetables. I love Pesto Pasta Sauce. Thanks for the chance! My Favorite Pasta Dish is Homemade Baked Mac & Cheese. I make it with Ham Cubes, Milk, Butter, Cheddar Cheese Poured over Elbow Macaroni topped with buttered Garlic Ritz crackers Baked in the Oven. I love making three cheese alfredo pasta! 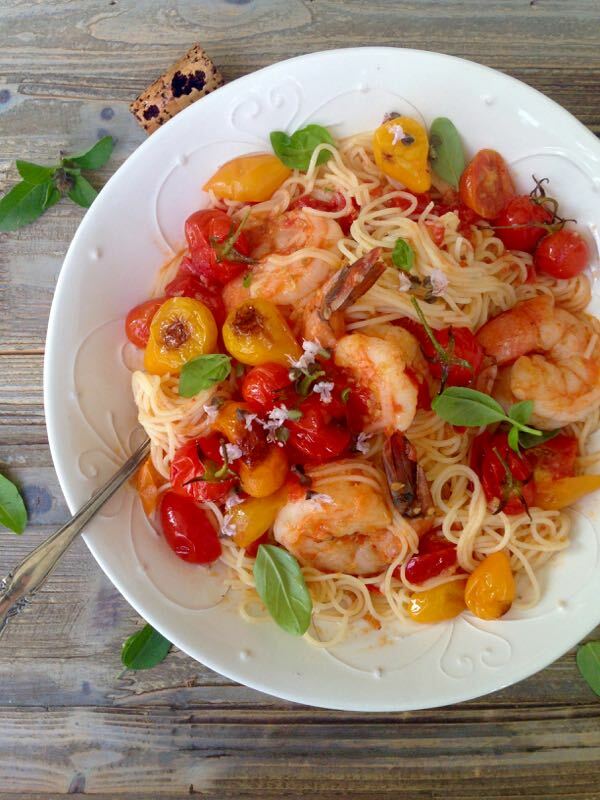 Jennifer Gardener’s Shrimp Orzo recipe! I love marinara, I am vegan so I don’t add any meat or anything to it. spaghetti and home made meatballs always hits the spot! Spaghetti and homemade spaghetti sauce. Linguini and clams in white wine sauce. My favorite is fettucine alfredo. Alfredo sauce is my favorite. Linguine & meat sauce is my all time favorite. Yum!! I’ve recently started making my own meatballs, so now our favorite is spaghetti with meatballs! Thanks for the giveaway! Pasta carbonara is my favorite. This looks great! 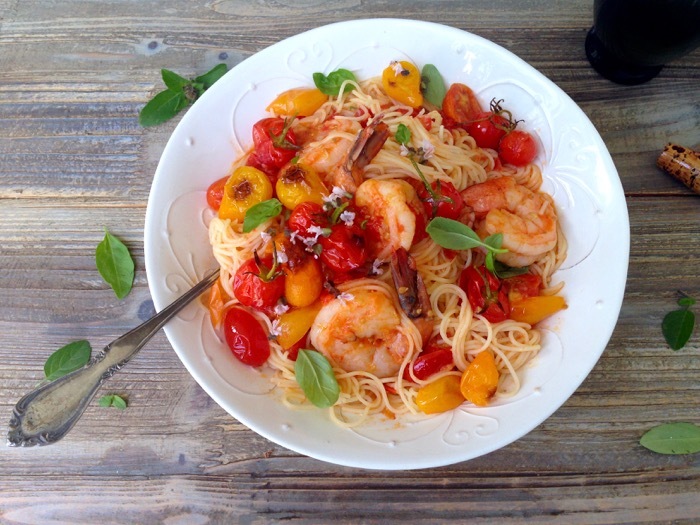 I love to make citrus shrimp with linguine. My favorite pasta dish is chicken piccata with angel hair. I love fettuccine chicken alfredo! My favorite has to be pasta with lemon tuna and capers…or puttanesca! 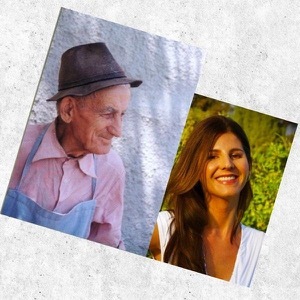 I have been making and eating fresh pasta and sauces for 1/2 a century. I have tried hundreds of Bolognese recipes and I must say yours is number 1 or 2. I saw you with Fabio a few years ago and marvel at your passion and love. It seems to be equally split between people and Italian food. I love to receive your mail and your terrific recipes that you share.I think I will make your Bolognese number 1. Chow Bella Florentina. I make a copycat Noodles & Company Penne Rosa that I love! It’s easy, and terrible for me, and delicious! My favorite pasta is pesto. We love Spaghetti. The kids eat it several times a month. We love pesto, but we are gluten-free so we do spaghetti squash (or GF noodles) instead of pasta. One of my favorites is spaghetti brushettta. This time of year I tend to prepare pasta with fresh local veggies and a light sauce. I love chilled pasta with lemon & capers or pesto. My favorite pasta recipe is good old fashioned spaghetti and meatballs with a homemade sauce. I love lasagna !! The more cheese the better !! This looks so delish! 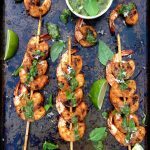 Have a question, can I put frozen shrimp without thawing in the mix? Oh and I just thought of salmon with it! Yum! Hi Melissa, I wouldn’t use frozen shrimp, they just won’t have enough time to cook in the sauce. Just run them under cold water for a few minutes and they will be great. Enjoy !